Ending Poverty. One parent, one child, one family at a time. Marillac St. Vincent Family Services is committed to embracing and caring for infants, children, teens, adults, and seniors living in Chicago who need support. Our comprehensive, multigenerational social service programs help our clients deal with life’s challenges while giving them the necessary tools to improve their lives. We believe it is about empowering, not enabling, in order for those we serve to become productive members of society. The most important early goal in the life of a child is to become an enthusiastic learner. This means encouraging children to be active and creative explorers who are not afraid to try out their ideas and think their own thoughts. We follow their interests so they’re engaged and excited about learning, and we do it at their pace so they learn in the way that is best for them. Here, children learn, not just in preparation for preschool, but in preparation for life. When children are independent, self-confident, and inquisitive, they can do anything. 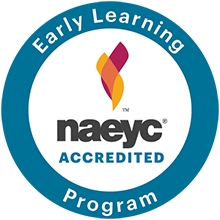 Our program’s Accreditation by the National Association for the Education of Young Children (NAECY), and inclusion in the ExceleRate Illinois Gold Circle of Quality shows our commitment to excellence in early education. 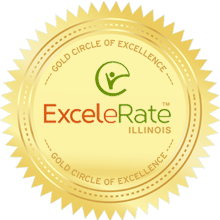 Over 90% of our 420 children served annually meet or exceed school-readiness “Widely Held Expectations” determined by Teaching Strategies GOLD™. We achieve these astounding results by committing to the forward-thinking, research-based Creative Curriculum®. Every child enrolled at MSV is designated a Family Support Specialist who monitors their development from day one. Family Support not only strengthens the bond between parent and child, they are able to identify when early intervention services are needed, asses the needs of the whole family in times of crisis, and recommend services based on each child’s needs. Our mission-driven approach to staffing has ensured low teacher turnover rates and contributes to the family atmosphere at our centers. Our educators have a unique understanding of the challenges distressed communities face and that understanding informs the strong, loving bond they develop with the children in their classrooms. Through a wide array of services for youth, school-age children and teens are working together with our staff to develop positive relationships that will allow them to discover who they are and learn how to be leaders in their communities, developing tools to carry throughout their lives that will steer them away from violence and become global citizens of tomorrow. We offer 430 children and teens quality out-of-school time experience where they can participate daily in safe, healthy, structured activities, developing a strong sense of self-worth, increased sense of opportunity, and better ability to fulfill their potential. Community Outreach Services inspires and empowers adults, families, and seniors to work towards self-sufficiency and stability. Through individualized support, access to on-site resources, and strenghtening community connections, adults and families receive tailored services to meet their specific needs. We meet the needs of our seniors through comprehensive, individualized case management care, monthly meetings for mobile seniors, and visits and food/meal support for our homebound elderly. We improve the health and well-being of tens of thousands of individuals by providing access to shelf-stable food, fresh produce, dairy products and meat from our two food pantries. We bring stability to lives of seniors, low-income families, and disabled person by assisting in the application process for public aid programs including energy assistance, SNAP, TANF, Medicare, Medicaid, reduced transit fare assistance, and more. Our case managers help marginalized individuals take the first step towards a stable life by helping to set goals for employment and education then provide resources and support to accomplish those goals. At Marillac St. Vincent, we believe it is never too late to learn something new and start fresh by continuing your education. That’s why we offer pre-GED assistance, computer basics, and adult literacy courses each week.